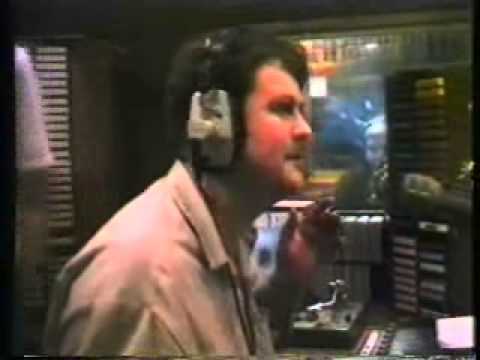 Belfast famous independent music promoter (Terri) Terry Hooley entertains with anchorman Denis Murray to take the Million Watt FM station off the air. Ireland enjoyed almost 20 years of unprecedented revolutionary broadcast radio, which directly effected broadcast radio and TV in the UK. These stations broke the mould in broadcasting in the British Isles, as Radio Caroline did in the 60s. While all this was going, the North of Ireland was, and continues to this day, to be a radio backwater. While many low power border stations gave multiple radio formats to a wide regional audience, Belfast was stuck in a dark hole of dead monopolistic dead radio. KISS FM 103.7 and K.I.T.S gave it something bright professional and new, in those dark days where the BBC’s Radio 1, was still only an AM station. Dec 30th 1988 was the forced closedown date all over Ireland of these private fresh professional and community stations. My dear friends, colleagues and I created KISS FM 103.7 /AM 1008 to give Ulster and Belfast a blast of fresh air. We went out with a blast, Running the secret I-T-S, and gave Ulster its first blast at the peace process and higher Awareness. Other vital Stations:- Radio NOVA, Sunshine Radio, and many more. Terry Hooley a famous character in the Ulster music business features on Parts 1,and 2 of this close. See Part 3 for Tom Hardy to take the Million Watt FM station off the air. KISS FM was to return in the mid 1990s as Energy 106.6, to finish the job. Both stations engineered and built by myself Miles Johnston. KISS Co Creator Jeff Camblin. Dedicated to close friends who have left us since this clip was shot all those years ago.